Easy Setup - Up and running in 2 minutes. Copy and paste code on your website to get started. No coding required. Beautiful and Customizable - Choose a theme to match your website and brand. Impress your web visitors. Take chats on IM - On the go? Use Google Talk (Gtalk) on your laptop, desktop or smartphone. 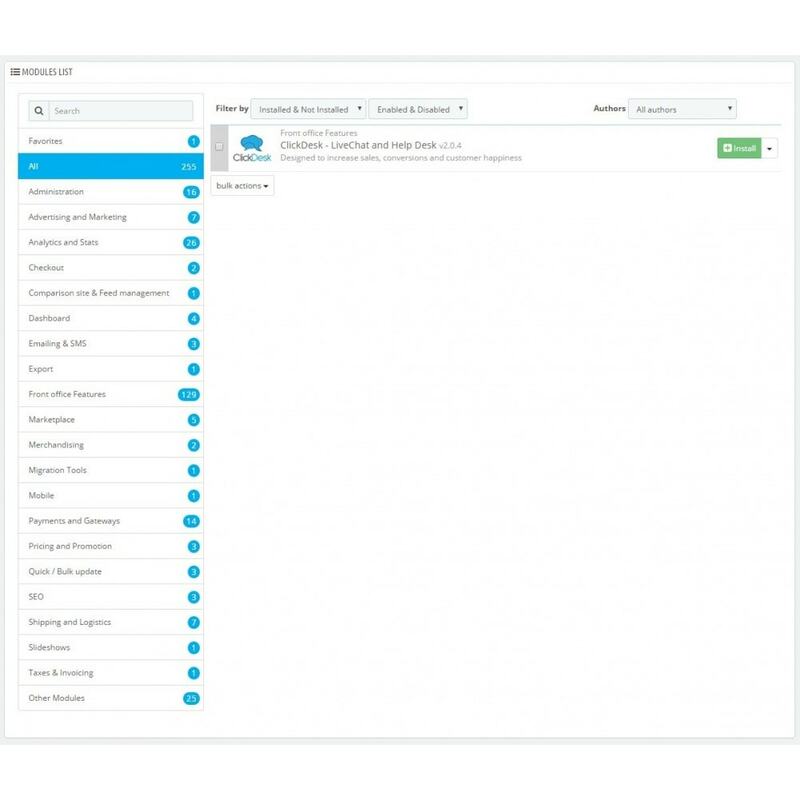 Unlimited Departments - Route chats from your pricing page to sales. Group agents and provide better support. Unlimited Websites - ClickDesk lets you run your code on as many site and blogs as you want, at no extra cost. Chat Conferences - Help customers as a group with rich three-way conferencing between your agents and visitors. Persistent Conversations - Our live support widget follows visitors as they browse through your website, providing a seamless chat experience. Chat Transfer - You can also transfer chats to other agents' mobile or desktop to help close leads or provide stellar support. Work as a team. Agent Levels - Use Agent Levels to prioritize chats. With levels everyone can stay online and chats are automatically passed to higher levels. Beautiful & Customizable - Choose the customizable theme that suits your site. Mix and match from a range of colors and icons. Language Localization - Localize ClickDesk widget into the language your web visitors would like to communicate. Real-time File Sharing - Share documents, photos and presentations over chat with our file sharing feature. 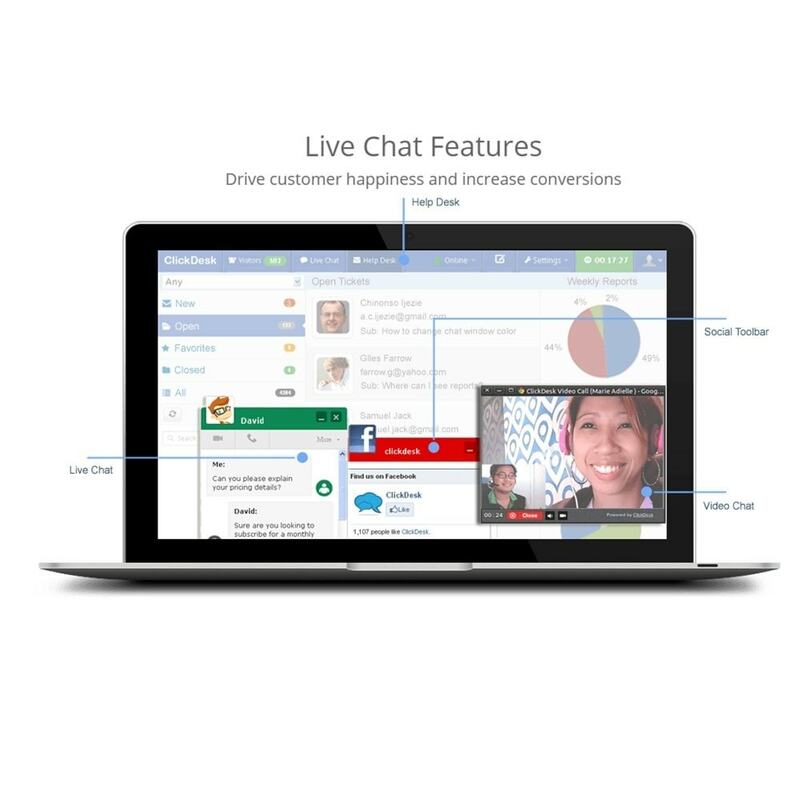 Simultaneous Chats - Chat with up to 5 customers simultaneously from our intuitive webchat panel. Shortcuts - Save common answers and replies as shortcuts. Answer FAQs with a single click during chatting with visitors. Offline Support - ClickDesk automatically sends offline chats to the in-built helpdesk so you can handle them easily as tickets. Your chat software should be fast and customizable. That's where ClickDesk comes in. 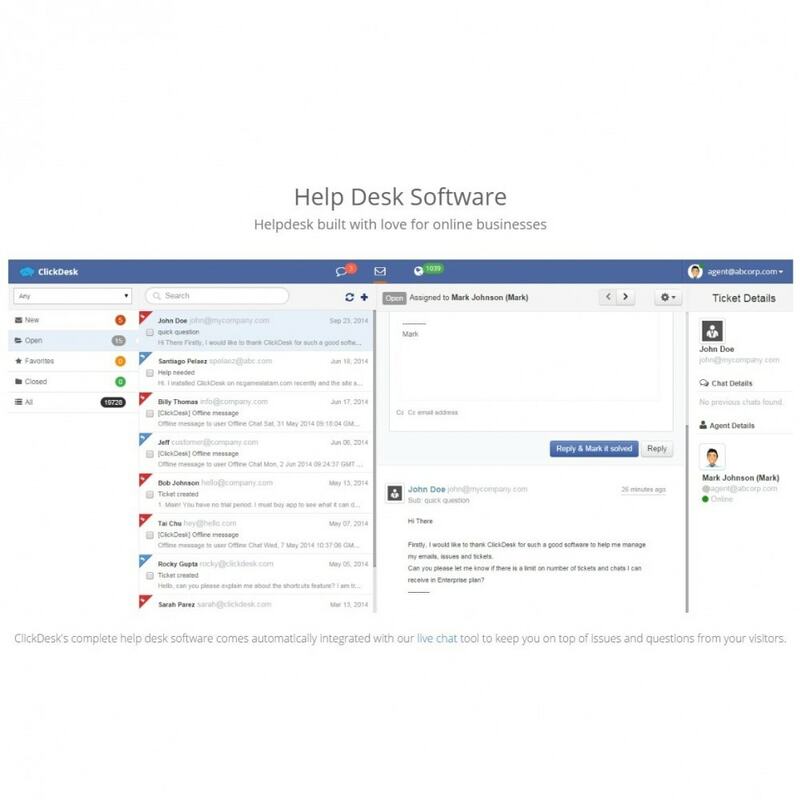 As the leading live chat app for over 100,000 small businesses in more than 100 countries, we've designed ClickDesk to be remarkably easy to use from any device, anywhere, anytime. 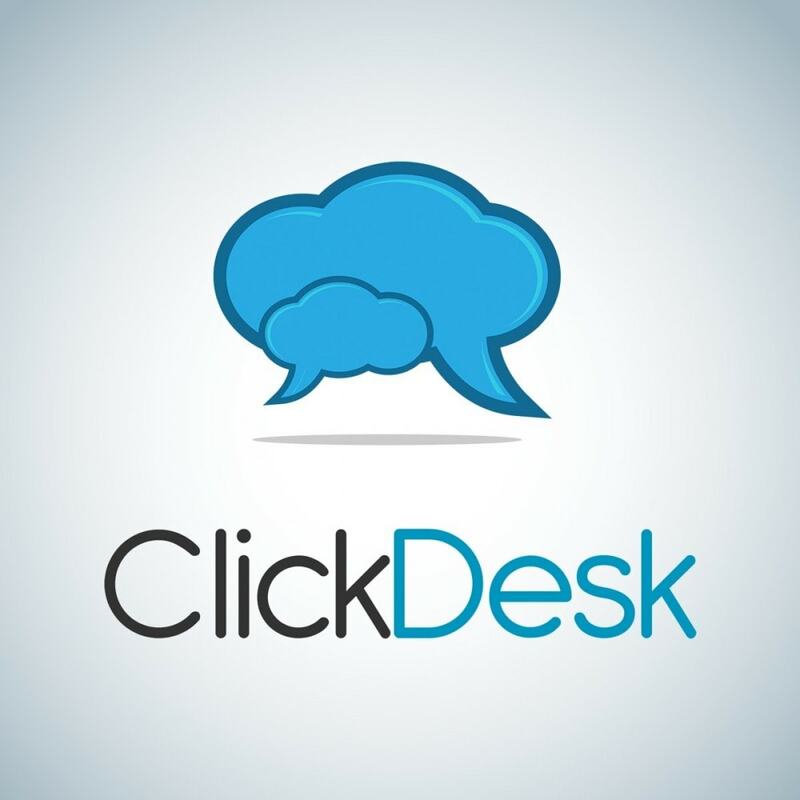 ClickDesk installs in minutes so you can instantly start providing live support to your web visitors. Whether you're focused on live help or sales, your agents will love the experience and your customers will come back for more. 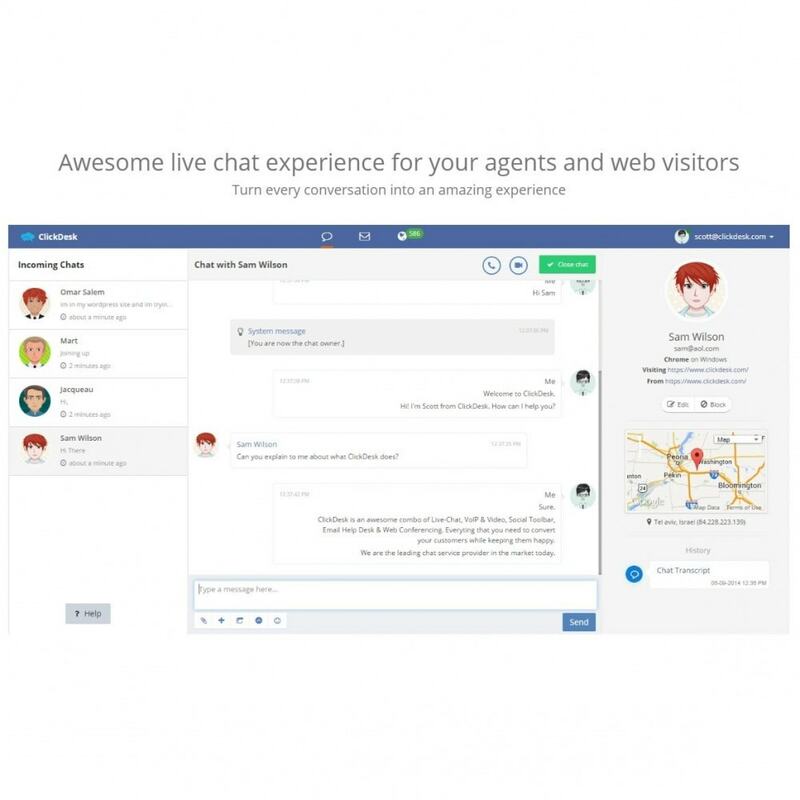 Awesome live chat experience for your agents and web visitors - Turn every conversation into an amazing experience. Intuitive web chat panel lets you focus on live support. Easily handle simultaneous conversations and tickets. 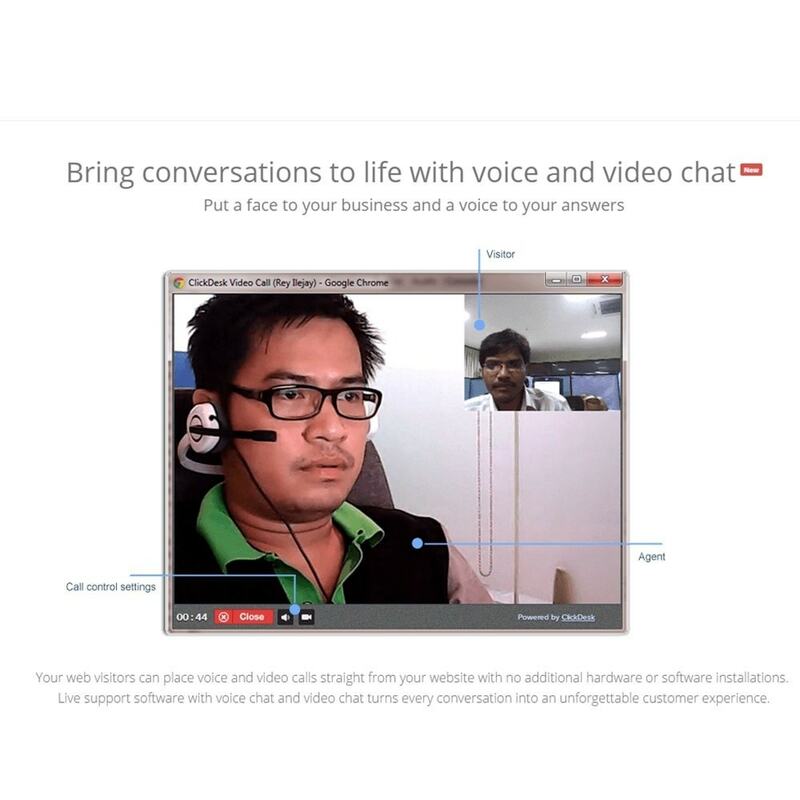 Bring conversations to life with voice and video chat - Put a face to your business and a voice to your answers. Your web visitors can place voice and video calls straight from your website with no additional hardware or software installations. Live support software with voice chat and video chat turns every conversation into an unforgettable customer experience. Integrated helpdesk ticket management - Streamline your customer support. Never miss an email or offline chat. Simplify your support with an easy-to-use, multi-agent helpdesk system. Keep track of issues and offline chats. 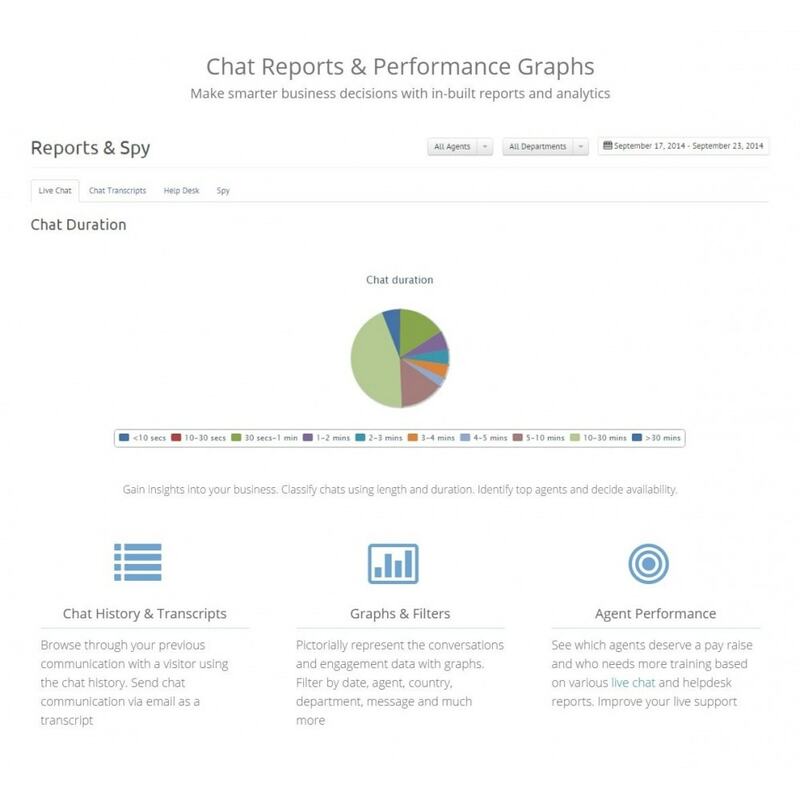 Chat Reports & Performance Graphs - Make smarter business decisions with in-built reports and analytics. Gain insights into your business. Classify chats using length and duration. Identify top agents and decide availability. 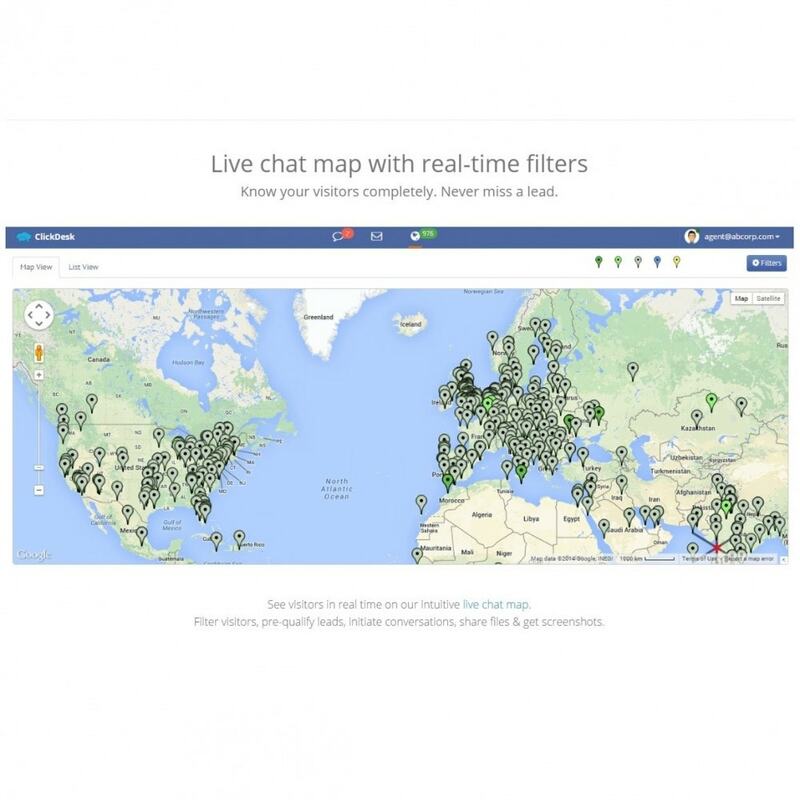 Live chat map with real-time filters - Know your visitors completely. Never miss a lead. See visitors in real time on our intuitive live chat map. Filter visitors, pre-qualify leads, initiate conversations, share files & get screenshots. Maps - Know your visitors completely with our web chat panel's intuitive live chats map. Hover over any visitor to see essential real-time information, including name, email, country, chat history, browser and referring URL. Initiate conversations with your hottest leads. Filter visitors by country, web activity, chat status and more. Proactive chat greetings - Send a personalized greeting automatically based on visitor location, URL or the time spent on a page. Welcome your visitors with greetings and turn them into customers and improve customer satisfaction. Pre-chat surveys - Collect the visitor name, email address and a brief message to help you get started. Identify existing customers using our app integrations and amaze visitors by being up-to-date on their customer history. Cross-platform software with a global outlook - Live help, video, calls, help desk and automatic translation, all from our web chat panel. Chat from your browser, smartphone or GTalk. Offer live support from GTalk - With ClickDesk, you have complete flexibility to take chats on your favorite IM such as Google Talk. Receive chats from your friends and customers in the same place. Achieve chat awesomeness without learning any new tools. 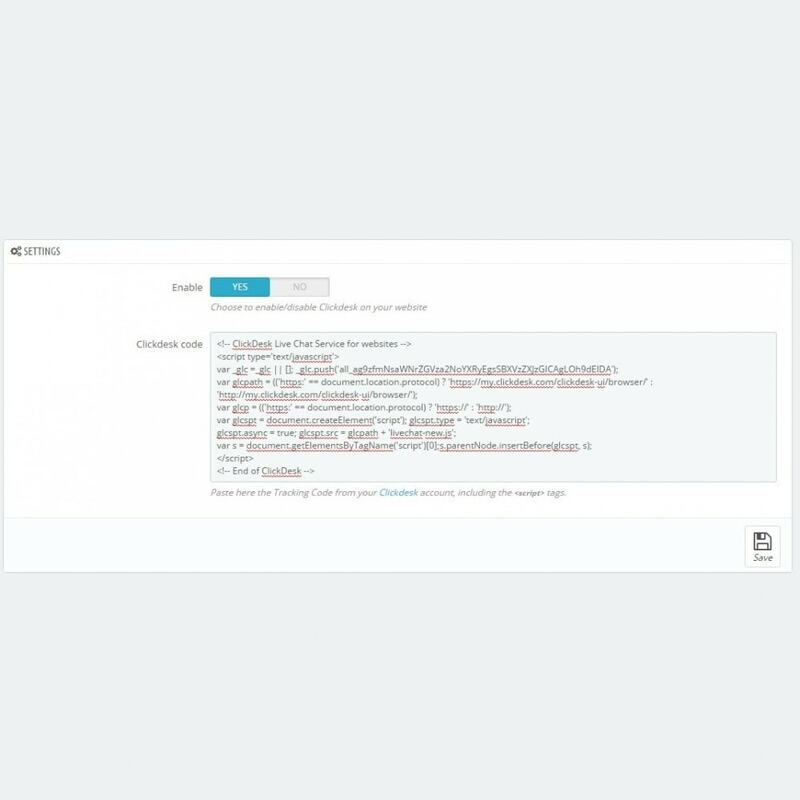 Read your visitors' minds - Our unique chat software includes a powerful Keystroke Preview that lets you see what visitors type before they send it over. Understand your visitors more completely, anticipate their helpdesk questions, negotiate better and close more sales. Chat in 90+ languages - Use our translation feature while chatting with visitors in any language. When a visitor posts a message in a language other than your own, just click on it and the message is translated right in the webchat window. Measure Chats with Advanced Reports - See real-time reports and trends on chat and help desk tickets and get new insights into your business. ClickDesk believes that customers are at the heart of every business. The biggest brands in the world are using chat software to increase sales, conversions and retention. We offer affordable chat software for small businesses because we believe that every startup, SMB and ecommerce site deserves to have access to the same powerful tools for customer engagement. Plus, we offer seamless integrations with the apps and CMS you already use to run your business. Customer happiness is always the goal. Let us help you get there faster!